One of the greatest challenges for content managers and bloggers is consistency. Being consistent with your blog strategy is crucial for maintaining your readership while growing an audience. No matter how long you have been blogging, it seems that sticking to a schedule is one of the toughest things to do. There are numerous tools out there to assist you, but very few are actually geared to keeping your blog on track. A blogging schedule or editorial calendar is always recommended to help solve consistency problems with your blog or website. There are hundreds of spreadsheets and PDFs out there for this, but they are never dynamic enough to fit the needs of everyone. We began to realize this lack of a dynamic blogging calendar after we couldn’t fully recommend any in response to several questions about our own blogging process and couldn’t locate the perfect tool to include in our guide to starting a business blog. This editorial calendar is based purely on a Google Docs spreadsheet, allowing anyone with a Google account to use it and share it with others. All you need to do is follow the link and make a copy to get started! Click the banner above to access the spreadsheet. Once you do, you’ll need to save a copy to your own Google account. (Our version is write-protected so that it can’t accidentally be edited.) To do this, click File, then select “Make a copy” to start the sheet copying process (refer to the screenshot on the left to see how this is done). Rename your version, then save the new copy to your own account. 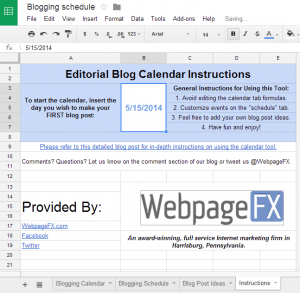 Now you have your very own free editorial blogging calendar and schedule right at your fingertips! Read on to learn more about how the calendar tool works, and how you can customize it to meet your blogging needs. I know what some of you pros are thinking. “Hm. Another Google Doc?” But hear me out. The difference between this editorial blogging calendar and all the others out there is that everything is dynamically generated and displayed to give you everything you need in an easy and convenient way. Who doesn’t like easy and convenient? Those principles are the basis of our free website calendar template. 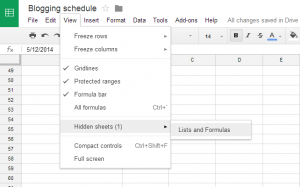 Don’t be intimidated by a complex spreadsheet full of formulas! We made it super simple to get started, and we kept all of our formulas hidden away to keep them safe. Here’s how to get things rolling. There is literally only one thing you need to do to get your copy of the sheet set up with a recommended blogging schedule: go to the Instructions tab and enter the day you want to get started. That’s it. 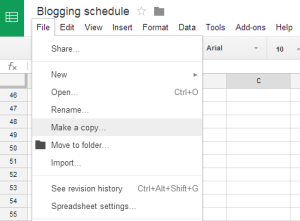 Enter the date you want to make your first blog post (in mm/dd/yyyy format) in cell B3 to auto generate your blogging schedule. This will tell all those crazy formulas what they need to do to get your schedule set up! We placed the Instructions tab as the very last tab on the worksheet. This keeps it from initially appearing every time you open the blogging calendar. If you are still tired of seeing it, feel free to hide it, but don’t delete it! That one cell controls the entire spreadsheet. Now that you have a date set, we can tell you what exactly is going on in each tab! This is your main dashboard, in which you can see exactly what is scheduled for this week and next week. The first section you see is this week’s editorial blogging calendar. Under each day, you will notice a main task for the day highlighted in blue. Secondary tasks and additional details from your schedule are also displayed underneath the main primary tasks. The next section is a simple heads-up for the following week. It’s always nice to see what kinds of things you should prepare yourself for, so we added in a “Coming Up Next Week” area right in the media schedule template for you to glance at every once in a while. The area on the side also includes some helpful information. We included a tab made up entirely of blog post ideas. While writing blog posts is generally your primary task, it’s always nice to have some suggestions here and there. These ideas are then displayed randomly three at a time on the main calendar dashboard. They tend to be fairly general topics or ideas, so feel free to go into the Blog Post Ideas tab and edit them to specific ideas of your own. I like to keep a running list of ideas for potential blog posts. Seeing these on the main dashboard and maintaining them in this tab is just another way to streamline your overall blogging process by keeping those great ideas fresh! In addition to the blog post ideas box, we’ve also included a helpful tip, as well as a resource to read for that day. Try not to edit any of the cells on this tab. These are dynamically populated and won’t work if you delete them or write over them. However, we have provided a weekly notes area that you are more than welcome to write in and customize! I repeat: the only cell you should edit on the Blogging Calendar tab is the “Weekly Notes” section. We tried to consolidate things enough that you won’t see a super complex formula in these cells. That way, if you do happen to goof something up, it wouldn’t be too difficult to figure out what that cell’s formula should be based on the ones next to it. If all hope is lost, you can always copy our version of the spreadsheet over again. The next section is where you can edit lots of information. The second tab in our free web calendar template is where you can customize your very own blogging schedule. Everything in the Blogging Schedule tab is dynamically displayed on the main dashboard blogging calendar. As mentioned before, we provided a beginner’s 90 days of blogging schedule already on this tab. However, you certainly don’t need to keep this information here. 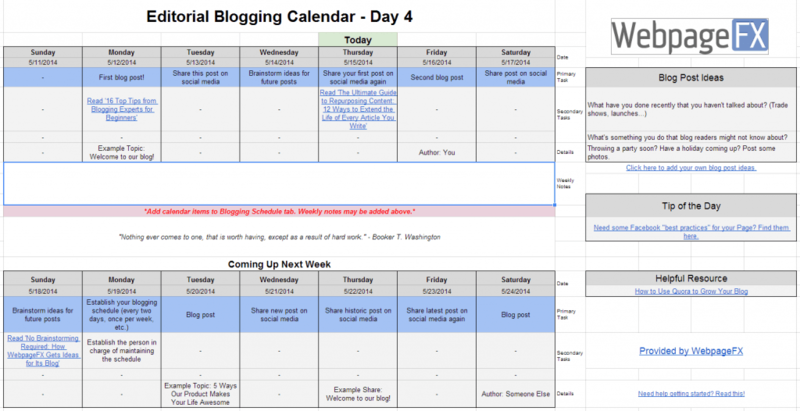 If you are experienced enough to make your own blogging calendar, change it any way you like. If you happen to be a new blogger and need some kind of guidance in your blogging schedule, consider this 90 day calendar template as a reference or coach for creating a proper blogging schedule. If you think it is too much to start out with, then by all means, feel free to delete anything beyond your own capabilities and customize it however you would like. If you plan to go beyond the prescheduled 90 day blogging schedule, then all you need to do is drag the last two or three rows down for as many days as you want. Select range A98:C99 and drag the little box on the right down to add more days to your schedule! Beyond adding more days to your schedule, you should avoid editing columns A, B, and C since a lot of formulas depend on what these cells are. Other than that, you are free to add, delete, or edit whatever you want for your schedule! 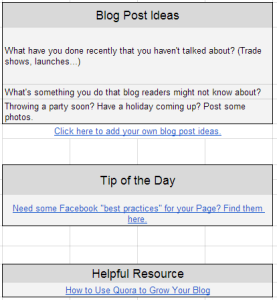 As mentioned earlier, this tab is just a collection of blog post ideas to help you out. You can delete or add more to this list as you wish. 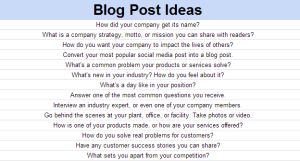 If you have a specific blog post idea, add it to the list and it will appear randomly on your dashboard. There is a hidden tab on this sheet. Don’t tell anyone, it’s a secret. If you click on the “View” dropdown, you’ll notice there is a hidden sheet named “Lists and Formulas.” This is where we hold all of our somewhat complicated formulas and lists of tips and resources. If you want everything to work right, then you probably shouldn’t edit this tab at all. Having said that… we realize that some of you are the adventurous type and will check it out anyway. Don’t worry, we will always have a copy of the spreadsheet here that you can refer to if anything is accidentally changed or broken. Nothing in this tab is rocket science – just a bunch of ifs and vlookups. If you are somewhat knowledgeable in Excel or Google Docs, you should be able to find your way around this in case you want to add some custom functions to the worksheet itself, or throw in a few new resources or inspirational quotes for your team. Just make sure you hide the tab again when you’re done! We made this calendar for you, our readers. We hope you find this to be a worthy resource. If so, please let us know! We would love to hear how you think we should improve it or what needs changed! We could have created an online tool that you had to sign up for, but we wanted you to have full control over your content — thus the Google Doc. It isn’t hard to make your own adjustments to the spreadsheet itself. 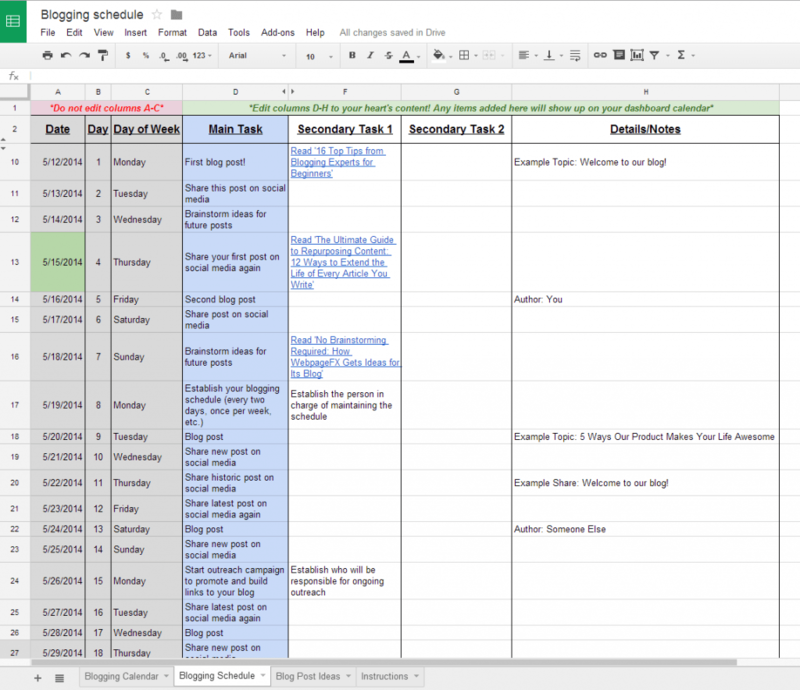 Whether you are an advanced blogger with experience in alternative blogging schedules, or you’ve never even thought of making an editorial calendar, this should assist you in making your blogging tasks consistent and on schedule. Tell us how you are using this in the comments below. What did you add to it? What needs changed? Show us your version and share your document too! Kudos to anyone who can write up some super useful scripts for some of the calendar’s functionality. Or try protecting some of the ranges to keep other members of your team from changing the schedule! The possibilities really are endless. Questions? Suggestions? Ideas? We welcome any feedback whatsoever! Comment below or send us a tweet @WebFX. We look forward to hearing from you!